I thought I’d do one last entry on the Forgotten History this week, before moving on to other things. The picture above is one of the site-specific installations. 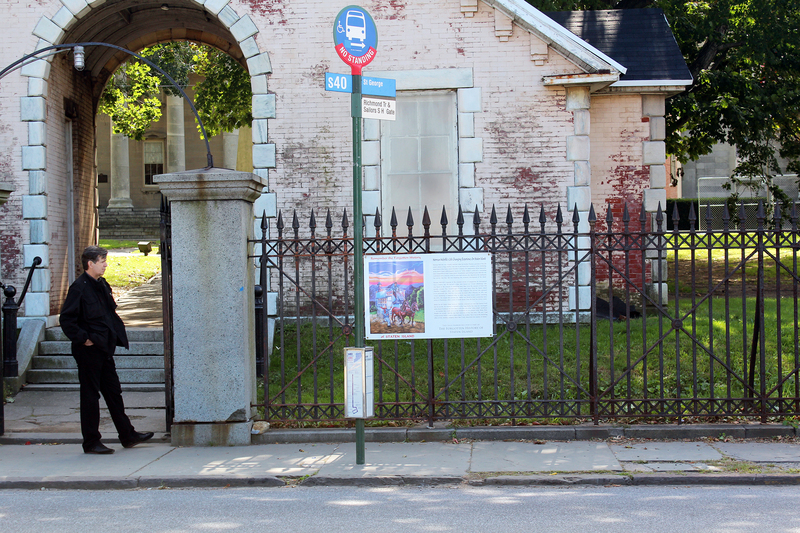 This is the bus stop at Snug Harbor where the entry about Herman Melville took place. All the people at Snug Harbor, particularly Patrick Grenier, Director of Visual Arts, were very helpful to me in the course of the project. However, I met with quite a different reception in some other places. At times I thought the Borough Historian for the Staten Island Parks Department (who is also the director of signage) might put out a contract on me. Although the Forgotten History might seem like a pretty inoffensive project, the idea that history is not all it’s cracked up to be, is quite threatening in some quarters. To those folks, the Forgotten History was an attack on all they stood for. On the other hand, the general public seemed to enjoy what I was doing. During the grant period, I went around to the locations to check the conditions of the installations, and inevitably I got into a discussion with people there who were reading the Forgotten Histories. They would go point, by point, and ask me what parts I made up, and what parts were “true.” I was happy to explain what parts I made up, but I always reminded everyone, that there was no guarantee that the other parts, were not also made up, by someone, at some point in time. Below is the entry that is shown on the installation above. Herman Melville was virtually destitute when his brother Thomas, governor of the old sailor’s home at Snug Harbor, took him in and found him a position in the scheduling department of the Staten Island Omnibus Company, the organization whose mammoth, horse-drawn buses (affectionately known as “white whales”), achieved a commuting time comparable to today’s mass transit. 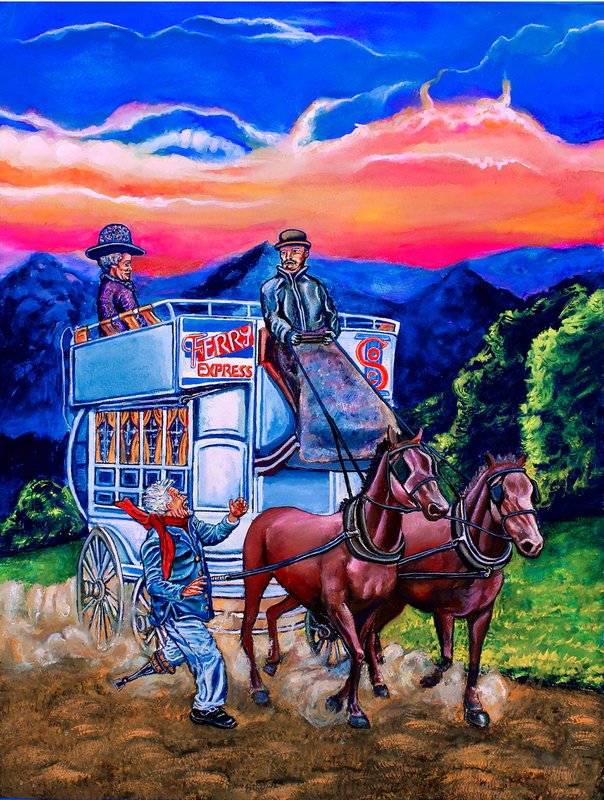 Though his new job had sounded dull, Melville was soon to learn it was just the opposite, as immediately upon taking his post, he was confronted with a raucous crowd of concerned citizens who objected to the inadequate bus service that they felt was hindering the economic development of the island. Herman Melville’s response to the stream of antagonism he encountered was a creative one. He devised a plan (later known as “virtual scheduling”) that was based on the concept of scheduling approximately twice the amount of buses that actually existed. This breakthrough diverted anger away from the Staten Island Omnibus Company’s office, and towards the company’s bus drivers who appeared to be perpetually late. Melville’s innovation increased office efficiency by 38%, and virtual scheduling is employed today by most large mass transit systems, including New York’s MTA. But despite this success, the author was forced to beat a somewhat hasty retreat to Manhattan, after a series of death threats from the local bus drivers union.